As the next step to http://www.nirya.be/snv/ttm/archives/000351.html, I’ve activated registered comments on this blog. 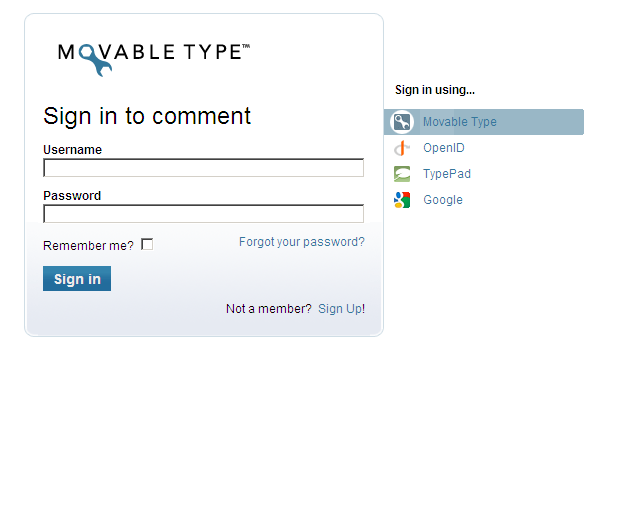 As of now, only registered users’ (actually trusted users’) comments will show up immediately. Comments left any other way, and that includes the way we did things before with just a name and email address, will be held back for moderation by me, meaning that I need to approve them before publishing. The idea is of course that spam comments will then no longer show up immediately. There’s a few other options (e.g. Yahoo) which I don’t think will be used much, but give a yell if you have an account somewhere that you might want to use here. At the moment, things are still a bit rough around the edges. For example, you can’t yet see whether or not you’re actually signed in - you’ll need to preview or post a comment for that. I’m working on the functionality to actually show whether you are logged in or not, but that might take a while to implement. If there’s any problems posting comments, or for any other questions, my email address is behind my name up there behind ‘Author’. Seems like a good diea. Most blogs I follow use a moderated comment system these days. Requiring ppl to have an account is maybe a step too much for some to comment, so keeping moderation on for non-signed in people might be a good idea.